How Inside Out Photo Booth NJ Can Change the Tempo of Any Event! 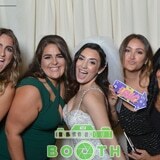 The Best Photo Booth Rental In Newark, NJ! The Best Portable Photo Booth In Paterson, NJ!